Register for a LIONESS Lab account to receive an email with your credentials. 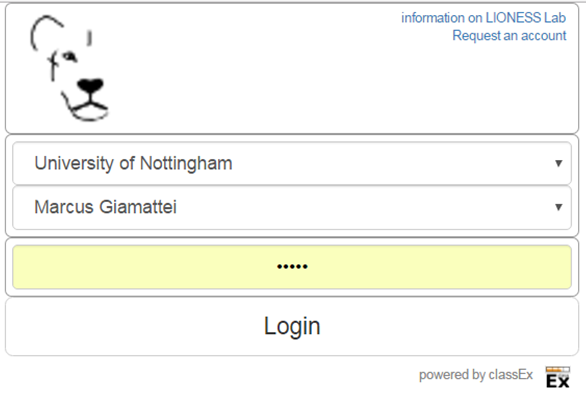 On the login page you find your institution and your account. Once you have logged in, the landing page allows for basic actions such as creating new LIONESS experiments, edit your existing experiments or change your user settings. To get a feel for LIONESS experiments, you can go to this demo. This will take you to the control panel of a 3-player public goods game experiment. The link will open in a new tab. With the Control Panel you can monitor the progress of an experimental session. On the top of your screen, you can start test players to stand in the shoes participants. As you operate these test players, you can track their progress at the bottom of the Control Panel. The control panel regulates the progress of participants through the experiments, so this screen always needs to be open as a session is running. Expected time to complete this tutorial: 30-40 minutes. In this section you find a quick start tutorial to familiarize with LIONESS Lab. Later in the documentation you can find more detailed instructions. The steps below show you the basics of LIONESS Lab by taking you through the development a simple 3-player repeated public goods game. Box 1 shows the general setup of this experiment game. Following the steps below will make you familiar with using the basic features of LIONESS Lab. For your reference, a finished version of the experiment we will develop here can also be directly imported from the is directly available at the example game folder. In each period of this game, each of the three participants in a group receives 10 points. Each group member simultaneously decides how many of these points to contribute to a group project (and how many to keep for themselves). The contributed points of all three group members will be multiplied by 1.5 and equally divided among the group members, irrespective of their contributions. This setup reflects a social dilemma: average payoff in a group is optimal when all group members contribute all 10 points, but it is individually optimal to contribute nothing and benefit from any contributions from the other group members. After making all group members have made their contribution decisions, they will be informed of the outcome of that period and a new period will start. On the landing page, choose New experiment to define a LIONESS experiment starting from scratch. In the Experiment Settings, you can give the experiment a name, say Public goods game. 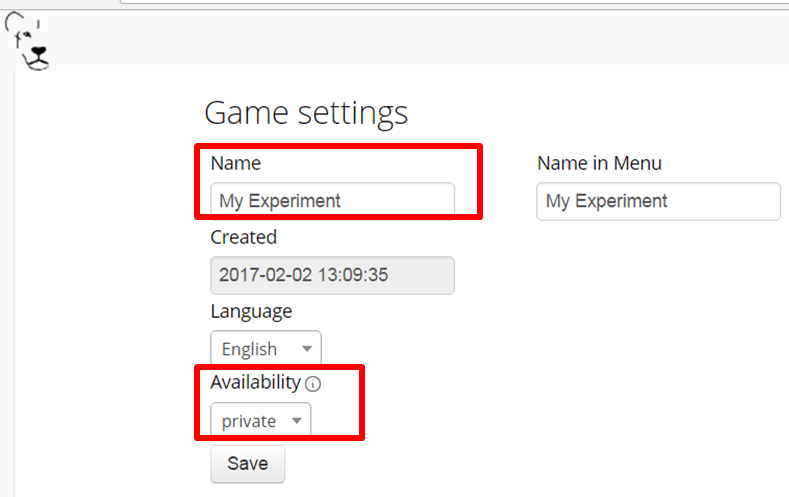 For now, you can set the availability of your experiment to private but you can choose to share it with others by setting the availability to public later. For now we can ignore the fields on the right hand side. Click Save to start defining your screens. 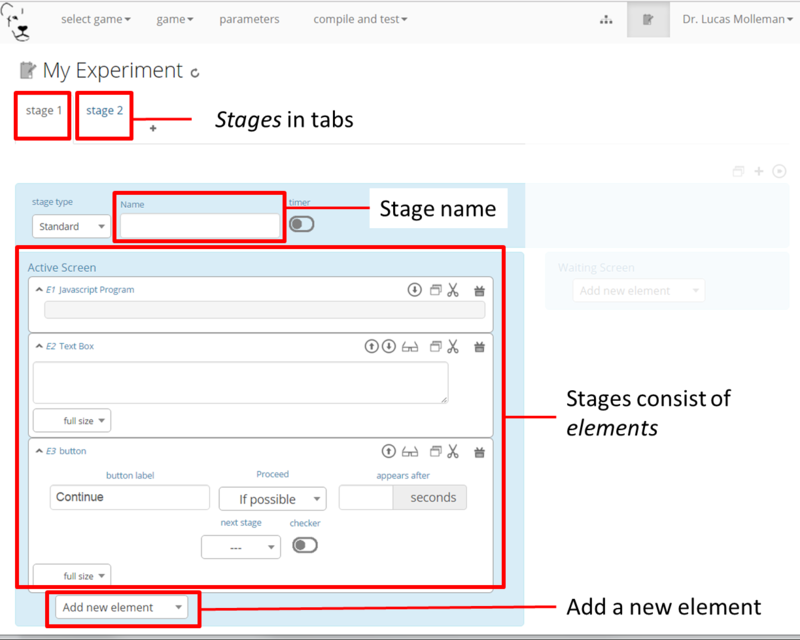 Below the name of your experiment you can now start defining your stages as they will be displayed to participants. Two stages are pre-loaded (see screenshot above). Make sure that you select the tab named stage 1. The area under the tabs shows three sections, each with a blue background. First, in the broad horizontal bar you can specify basic settings of that stage, e.g. its name, the stage type of the stage, and an optional countdown timer. Second, in the left hand side section you can specify the active screen. In active screens you can display information to participants and record their responses. Third, in the right hand side option you can specify the waiting screen of that stage. In case participants need to wait for others before continuing, this will come in handy - we will get to that shortly. In the next steps you will define your own Public Goods Game. While defining your experimental screens, you can see how they look from the participants’ perspective by compiling your experiment and starting a test player from the Control panel. For the sake of exposition, we will do this only at the end of this tutorial. In this basic public goods game, we want the participants to read instructions first. Name this stage Instructions in the broad horizontal blue bar. In the active screen you can add instruction text by double-clicking the text box (second element). You can write instructions in the rich-text editor by yourself or but for now just copy in the template text from the Box 2. Finalise your instructions stage by specifying the button at the bottom of the screen. Make sure that the next stage is Stage 2 and retain the default options for the button (so that participants can proceed if possible). Your changes to the experiment will be automatically saved upon every mouse click. At any time during development of your game, you can view the experimental pages as the participants will see them. To do this, simply compile and test your experiment and start a test player. In the next stage, we will define a set of control questions to ensure that participants have understood the instructions. Click on the tab Stage 2 and name this stage Control questions. In the broad horizontal bar, set the stage type to quiz. In quiz stages, the LIONESS software automatically records the number of attempts by each participant to answer the control questions. Announce the control questions in the pre-loaded text box. To add your first control question, click add an element and choose numeric input from the drop-down list. Small paste icons will appear between each of the elements in the screen. Click on the icon right under the text box to add the numeric input element. Once this element is added to the screen you can write the question in the text field of the element. 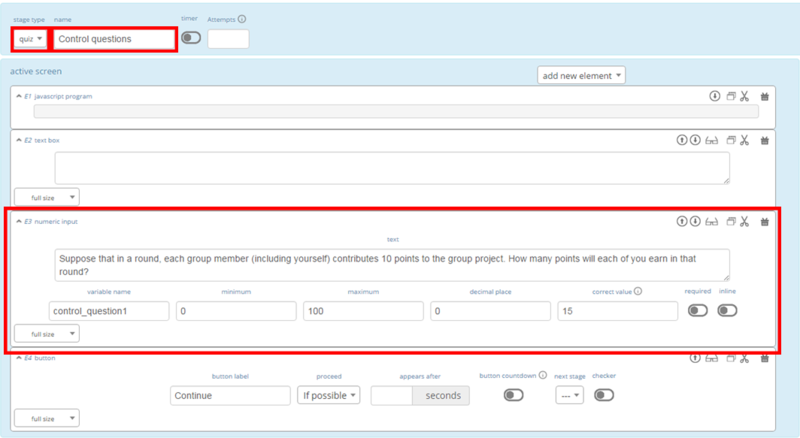 In this case, write Suppose that in a round, each group member (including yourself) contributes 10 points to the group project. How many points will each of you earn in that round?. Add a variable name, say control_question1. Specify the range of numbers that participants may enter. In this case you can set the minimum to 0 and the maximum to 100. Set the decimal place to 0 such that the participants’ screen will only accept integers as a response to this question. By clicking the required switch you can make sure that participants require to give a response to an element. Set the field correct value to 15. Finally, add a button to the screen by clicking add new element and select the button. Add it to the bottom of the screen by clicking the paste icon right below the numeric input field you just created. Keep the defaults for now. The next stage will be a lobby in which participants wait to be grouped with others. In this case we will form a group as soon as three participants have completed the control questions and are ready to start the interaction phase of the experiment. Add a new stage to your experiment by clicking the + sign in the tab next to Stage 2 (see below). A new Stage tab will appear. In the horizontal blue bar, set its stage type to lobby and name the stage Lobby. Set the timer to 300 seconds and delete the button (we do not need a button in the lobby). When participants are still waiting to be matched with others after this time has passed, they will automatically get the choice to either return to the lobby and wait for two more minutes, or to proceed to another stage (defined in the leave to field, we will get to that later). In the active screen, the default text in the lobby reads Wait for the other members of your group to complete the control questions. For now we do not need to define anything here. We do not need any buttons in this screen. The software will forward the participants as soon as a group has been formed. To add the field in which the participants can enter their contributions, click add new element, choose numeric input and paste this element below the text box you just defined. In the text field of this element, you can write: You received 10 points to start with. How many points (0-10) do you want to contribute to the group project?. Set the variable name to contribution, set the minimum to 0, the maximum to 10 and the decimals to 0. Switch on the required option to ensure that all participants make a decision, which will be stored in the decisions table of this experiment’s database. Participants’ entries in input fields will be automatically recorded in the database. Variable names of input items need to be unique (so, no variable name should appear more than once in your experiment). In addition, make sure that within a screen, variable names of input elements are different from variables names you use in JS elements. Finally, in the button at the bottom of the screen, specify proceed as wait for others. This will ensure that the participants will only be able to continue to the next stage when all group members are ready. Participants will wait for others in the waiting screen on the right hand side section. When nothing is defined in the waiting screen, a default waiting text will be shown. For now we can leave the waiting screen undefined. To display the calculated variables, again use the dollar signs around the variables names in the text box. The Results stage is the second and last stage of a period. To define the correct routing of the participants through your experiment, you should specify which of the stages comprise a period which will be repeated. Technically, this means that the program will loop through these periods for a number of times. You can do this in the parameters table. You can find this at the horizontal grey bar at the top of your screen. Here you can specify the basic parameters underlying your experiment. To specify the beginning and end of the periods in your experiment, set loopStart to Decision and loopEnd to Results. Now you are editing the parameters table, you can also set the number of periods (numberPeriods) to 5. By clicking the Back button at the top you return to the page in which you define your experiment. You are almost done specifying your experiment. For now you can leave the next stage field of the button empty. Your contribution to the group project: $myContribution$. Average contribution in your group: $averageContribution$. Sum of contributions in your group: $sum$. This amount is multiplied by 1.5, yielding $product$. Each group member receives an equal share: $share$. Points kept for yourself: $keptForSelf$. Your share from the group project: $share$. Your total earnings in this round: $earningsThisPeriod$. Once the decision making part of the experiment is over, you might want to add a questionnaire stage. Add a new stage, again by clicking the + sign in the rightmost tab. Add a new numeric input for the question What is your age?. For these numeric inputs you need to define a range of allowed values. Then, add a discret choice for the question What is your gender?. For the numeric element for the age you should now be able to define it. For the discrete choice, you can specify the question in the text field. At the bottom of this element you can define the text inside each of the choice options that the participants will choose from. 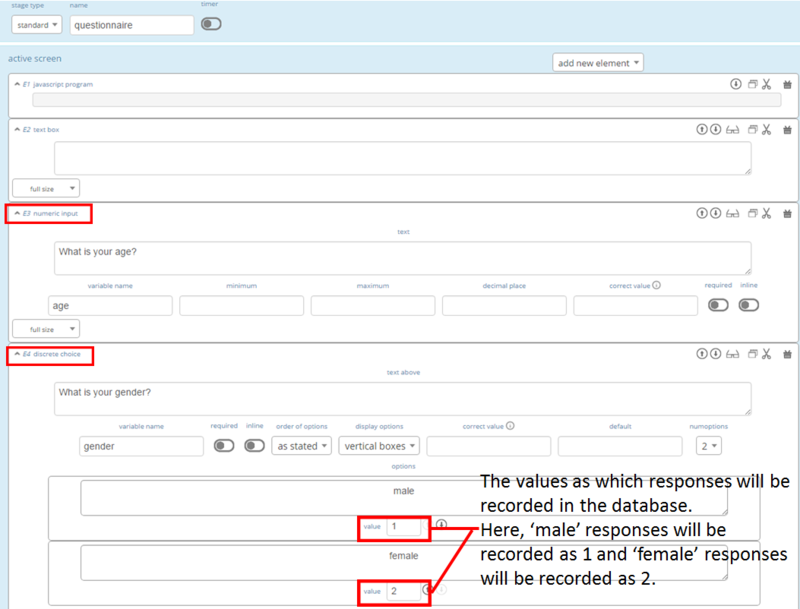 In the value field of each choice option you have to specify the value as it will be recorded in the database (which, for this element type, stores the responses as numbers). Ensure that the button allows participants to proceed if possible. You have arrived at defining the final stage of the experiment. Add a new stage with the + sign. On this page you will sum the earnings of each participant and display it on their screen. To do this, we will sum the participant’s earnings across all rounds. In the text box you can write the total earnings (in experimental points and real currency) to the participants’ screen. Note the variable exchangeRate, which is defined in the parameters. Your final earnings are: $totalPoints$. These points are worth: $valuePoints$. Before we start testing, we need to set the parameters. You can do so by clicking parameters in the top horizontal menu. In the parameter table we will define where a period starts, and where it ends. In the predefined parameters table tab you can set the parameters loopStart to Decision and loopEnd to Results by using the drop-down menus. This means that at the end of a period, and when a new period starts, groups will move from the Results stage to Decision stage. Once the period number reaches numberPeriods, participants will proceed to Questionnaire (the stage defined right after Results). Your experiment is now ready for testing. In the horizontal bar on the top of your screen, click compile and test. LIONESS Lab will compile your experiment and will open the control panel of your experiment in a new tab. In the control panel, you can start testing your experiment by switching on the test mode and start a test players. A new tab will open with the experimental pages you defined - this allows you to see how the pages you defined will be displayed to participants. If needed, you can start a second test player (e.g. to play in a group after being matched in the lobby).